Rhubarb Dream Bars are delicious and easy to make! My rhubarb has been up for awhile now and ready to be picked. We have then had some visitors to my patch. A deer that is staying in our backyard and surrounding neighborhood has given birth to twin fawns. They use my rhubarb patch to gain entry to the backyard and had started trampling the rhubarb. I quickly picked a bunch of it and found a great recipe for Rhubarb Dream Bars. These Rhubarb Dream Bars are easy to make and a great way to use up all that wonderful rhubarb you have growing in your garden! I planted even more rhubarb to make more desserts and recipes like Blueberry Rhubarb Jam, No Churn Rhubarb Ice Cream Recipe, Rhubarb Strawberry Cobbler, Super Easy Rhubarb Tarts, and Old Fashioned Rhubarb Loaf to name a few. With the deer around it was either the garden or the them this year and I quickly surrendered to the beauty of these animals. I can shop at the grocery store for all my fruit and vegetables, the deer can’t. So instead of fighting it, I happily let them in. Here she is standing in my garden, this is her preferred spot for lounging, nice and cool under the evergreen tree. Here is one of her fawns in my vegetable patch in the rain. She has made a little hole to lounge in there. How cute is she with those long ears! They are majestic gorgeous animals. This year instead of a garden I have deer growing in our backyard. These dessert bars are super easy to make and bursting with the taste of fresh rhubarb. Plus they are pretty in pink for a summer treat!! They are a tried and tested recipe here on Noshing With The Nolands and one of our most popular recipes now. Luscious creamy filling with the just right sweet/tart flavor from the rhubarb. They are also very easy to make and something that a lot of people enjoy as they are not a huge dessert and very portable to a BBQ, picnic or any gathering. Here are some other delicious recipes I have made using rhubarb, Rhubarb Strawberry Cobbler, Super Easy Rhubarb Tarts, Old Fashioned Rhubarb Loaf, Rhubarb Strawberry Crisp, Rhubarb Strawberry Sour Cream Pie, Rhubarb Lemonade, Rhubarb Ginger Granola Parfaits, and Strawberry Rhubarb Compote. 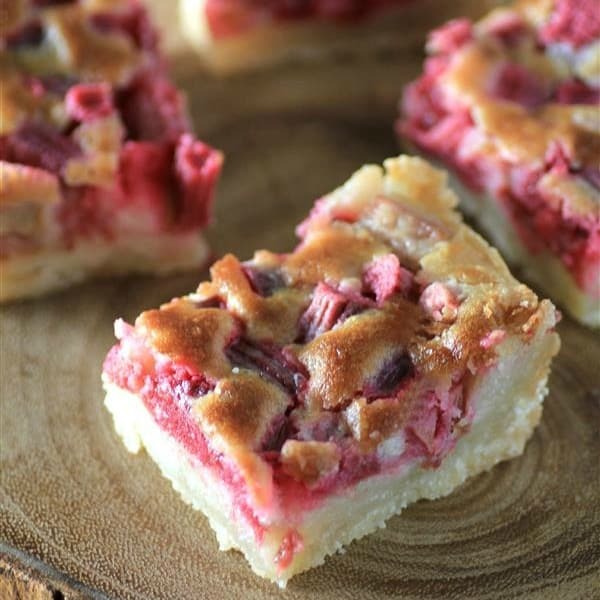 A delicious rhubarb creamy square that is perfect for the summer! You have a deer in your garden? I am SO jealous.. here in Australia we don’t get wildlife as awesome as that in our yards. Delicious bars too! 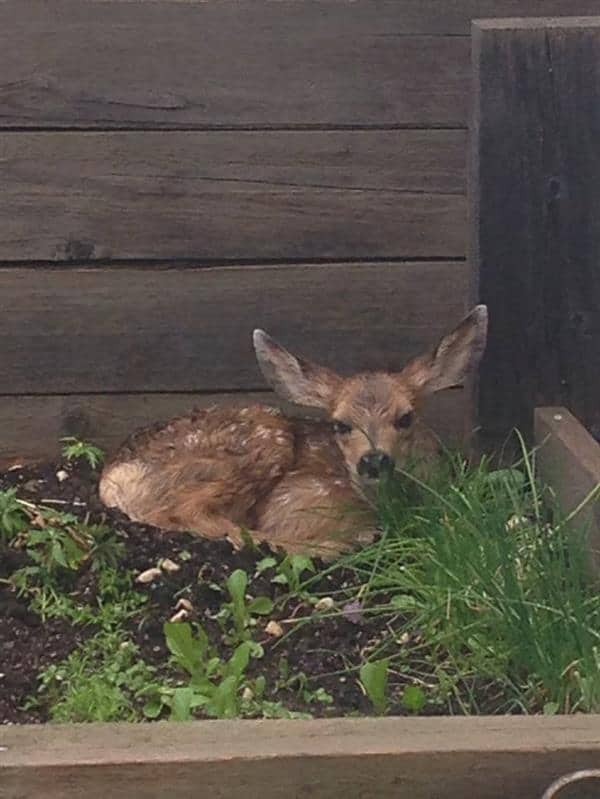 Well, we are growing deer this year not plants or vegetables but she is very sweet. Thanks Thalia. come take our deer! Every year they invade my garden!!! Hopefully the higher fence this year will keep them out. I haven’t seen any around for a bit and I am brave and planted more raspberries and strawberries. If you hang bars of soap around your garden they will sty away. I tried the wind chimes and they just ignore them. Would that be regular soap like Ivory? Not dove or olay type, has to be strong smelling like Irish spring, you know manyly fresh smelling strong scented. I should ask my parents in the north woods of Wisconsin if they have tried this. 26 years living up there and the deer get into everything that isn’t fenced off. Lots of cartoons about thanks for the buffet type jokes and deer reading “deer resistant” labels on plants and laughing. will try the recipe but I too am so envious of your “back yard” friends. Do you think you can hand-fed them? Oh how sweet they are – thanks for the photos. I did not want to try to hand feed them as I would like them to remain wild. They have moved on now for the summer but they will return. Your recipe sounds delightful. But your story of the deers was so sweet! Thank you so much, I did like the deer, they have moved on now and I have my garden back with lots of rhubarb to make these delightful bars!! Deer are beautiful, but can be destructive. Here in Canada, they’ve eaten most of my Mom’s flower bed and our veggie garden is protected by fencing…Pretty though! They are beautiful animals looking for food because humans have taken their habitat. I plant extra gardens near the edge of my lawn for them and I put a small fence around my garden and I have never had a problem. If not for location, this could be my backyard buffet. Such beauties! We get such harsh Winters here in Canada, letting them have free reign during the warmer months is the least I can do. Your rhubarb bars look delicious. It’s difficult to find a recipe that doesn’t include strawberries as a pairing. Wow, I don’t think I’ve ever run across a recipe for this anywhere but my mother’s kitchen before. Passed down from Great Grandma Grey. Memories! Even named the same. 🙂 I recently relocated across the country and I shared this gem with coworkers at the office. They were dying of happiness, it was so good. One difference though, besides a few measurement amounts, is that we always used powdered sugar in the crust, rather than plain white. It is truly drool worthy. You should give it a try and see how it compares. I’ll have to try your version, just to see. I bet they’re both delicious. It’s hard to go wrong with fresh rhubarb. Awesome Krystal, I will try that for sure, how much powdered sugar do you use? I’ll just share the whole recipe since there were a few other differences in amounts, then you can play around with the recipe however you want. We put this into a 9×13 pan. Bake the crust for 10 minutes only. We’ve also found you have to be really careful not to overbeat the eggs otherwise this strange crust seems to form on top of the rhubarb filling (doesn’t affect the taste at all, it just doesn’t look at pretty. – Have you ever found that to happen?) Our bars bake about 35 minutes or until a knife in the center pulls clean. I’d love to know how it turns out for you! Aren’t you the sweetest, thanks!! Can’t wait for rhubarb now!! Hello Krystal,, Just wondering if I used frozen fresh rhubarb, would it still turn out? I believe there has been some success with frozen rhubarb workin well. I personally haven’t tried it. Wish I would have read your comment sooner. Two cups of rhubarb was not nearly enough. It was good but not fantastic. With another two cups of rhubarb, it might be. Next time . . . . So bake the crust , like a pie shell , for 10 mins before adding fruit?? Yes, exactly. This will make sure the crust will bake properly. It looks like it has brown pieces of crust on top – how do you get the crust on top? It is just the filling that has browned up on top. i dont have the crust bubble up on mine, nor is the dish pink in color. Did I do something wrong? Not sure why the crust didn’t bubble, also I use very deep red rhubarb, it is the variety I have in my garden. Hi. Can’t wait to try this recipe. Looks amazing. Just wondering would you happen to have a weight equivalent for the butter. We don’t really use cup measures here in Ireland. Hi Tara, I tried this recipe and the bars were very good. However after a day or so they became very watery and soggy. I imagine from liquid released from the rhubarb chunks. Do you have any suggestions for me to try to avoid this next time? Thank you! I would up the flour in the filling if you have juicy rhubarb, some of the larger stalks carry a lot more water. I am going to make this later on today. I have my rhubarb waiting for me to make something. This is what I am going to do:::: cut your rhubarb for the pie into a bowl. Take about 7 tablespoon( a guess!) or maybe more of CORN STARCH and put it on the rhubarb and mix it up good with your hands so the pieces are covered with it. You be the judge as to how much rhubarb you put in the pies, as to how much corn starch. If you use too much, shouldn’t be any problem at all. It will just make it into a gel, and that could be good!! When I make fresh apple pies, I always put some cornstarch on the bottom crust before the apples. But putting it right on the rhubarb would be the better way. This recipe is a KEEPER! It didn’t last long enough for the rhubard to become runny! I think I will make some of these again today, thanks Shirley!! Sooo good! Made them this morning. Because the base recipe is so good, I will experiment with different toppings (Apple cinnamon, blueberry, peach). Yum! So glad you like them!! I did a very successful experiment with the same bottom and a pineapple, coconut, cherry, walnut topping. The post is coming out this Saturday so stay tuned. Another dream bar coming your way!! I just made them…..really good. Thanks for the recipe! Thanks for taking the time to tell me, so glad you enjoyed them!! I noticed the pink coloring in yours. Did you peel your rhubarb? Do you have any suggestions for add ins? Like nuts or other fruuts? No peeling, but I used really red rhubarb. There are loads of different varities of rhubarb, some redder than others. As for add ins, I have kept this one for the rhubarb to shine but I am sure a nut like a pecan would also work. All sounds divine Nicola, thank you for sharing! These look delicious! Would it still work if I double the recipe and put it in a 9×13 pan? My husband has no moderation when it comes to eating my baking so I fear I wouldn’t even get a piece of the 8×8!!! Sorry for the late response as I was away, yes for sure double the recipe and make it in a 9×13″, ENJOY!! Found this recipe on Pinterest and made it this morning–AMAZING. Loved the crust and rhubarb consistency…perfectly gooey and crunch with just the right amount of butter/sugar taste. Thanks so much for posting it! I’ll definitely make this again. Thank you so much Brandy, so glad you liked it!! I just made this and my filling is very runny and I baked it for 45 minutes. I follower it to a t and am wondering what happened. Your rhubarb must have been very juicy, next time add more flour if using the same rhubarb. Mine is also gooey! Do we keep baking it or just eat it gooey??! As long as it is not too browned you can keep baking it. 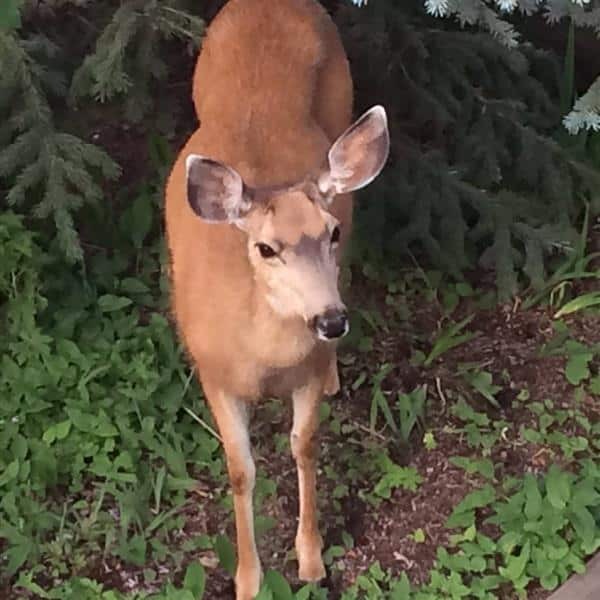 I too have visiting deer – use my garden as an hors d’oeuvre platter – little bit of this, little bit of that. A small price to pay for the privilege of their presence. Must try your recipe…. I wish it was a little bit of this and that. When she is pregnant she is starving. When she has her fawn she is starving!! I am up for a little battle this year and at the momment she has moved on. Love to see her and the fawn here and there but not living in my super small backyard. Not enough room for all. I hope you enjoy the rhubarb dream bars, we sure loved them! Granddaughters r here now…wanting rhubarb pie…I say I made this amazing rhubarb bar from Pinterest…. Yes even tho the seasons are rolling fast, I put rhubarb into freezer for these kind of cravings…so today with these charming g.daughters, they will make your bars! It is the tart, sweet we all love! Thank you so much for spring recipes! Thank you for posting the sweetness of the deer family…we too have a deer family we get glimpses of…oh the heart beats when seeing Gods creatures up close! Thanks so much Nancy, enjoy your day and your bars!! Does the rhubarb get really soft and runny when you freeze it? I have some I was going to make a rhubarb bread pudding using the frozen and was wondering how things turn out using frozen. I have used frozen rhubarb with success but don’t thaw it first, it make take longer to bake though. I don’t think so, I think it would get too runny. I really would like to try the corn starch directly on the rhubarb and then bake it. Doesn’t that sound better than more flour? Sure you can try that!! No, you don’t cook it first. Can hardly wait for them too cool!! They look delicious! In the oven right now. Can’t wait to taste. Thanks for the recipe. Hi could i use frozen rhubarb? You can try it, you may have to increase the flour if you think it will be too runny! How do you store them? Refrigerator? Counter? I put them in the refrigerator but they didn’t last long!! These look so good and the recipe is so easy! An easy to make, delicious and beautiful dessert! Definitely a keeper I will make often. These look amazing. Have you tried freezing them? I haven’t not sure how they would turn out, may get runny. I made these bars tonight, and they are awesome. I followed the recipe exactly, and they turned out beautiful. Will be making these again. Awesome, thank you for telling me!! We love rhubarb here!! Hi! I just harvested some rhubarb from my yard and am really excited to try this recipe! For the crust, is there a particular method for combining ingredients you’d recommend for someone who doesn’t have a food processor? Thanks! I would just work it by hand. i was thrilled with our new home and the wonderful rhubarb patchi found in the spring! When i found this recipe i was over the moon! However i have made it 4 or 5 times now, double checking everything but sticking to the recipe exactly and while the flavor is more than i could wish for the recipe is not working for me. the crust works out too hard (almost brittle) and the center is undercooked!! plz help me to find out what i need to alter to fix this! Hi Debbie, possibly it is the pan that you are using. What type of pan are you using? Is your oven accurate too? Also you could foil the outer edges so they don’t get overdone and then let the middle cook longer. i am using a glass pan (8″x 8″) and the oven came with the house and looks newer and seldom used. i just bought a oven thermometer to check on the accuracy. 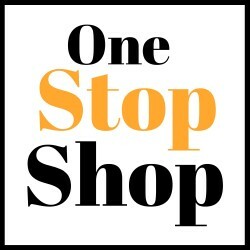 i will try one more time today and will keep you posted! I am sorry you are having issues. I used a cermamic pan but maybe a metal one would work better. Was just out looking at my rhubarb patch yesterday and can’t wait to make more soon. Not supposed to use metal with rhubarb. The acid in the rhubarb will eat the metal on the pan. Good to know, thank you Linda!! Many recipes suggest 25 degrees lower when using a glass pan. I used a Pyrex glass pan, lowered the temp and my rhubarb square was just perfect. I used a separate thermometer also, as i didn’t completely trust my old oven. Good luck with your next try! Great suggestions Shirley, thank you so much!! Are they better eaten cold or warm? Room temperature is what we have eaten them at. I am making these as we speak…so excited to try them after dinner tonight! We also have lots of deer by us 🙂 it’s a Wisconsin thing! Thanks for the easy recipe! I just made these & although the flavour is excellent, it took 55 min of baking before the top browned & by then the crust had also browned so it doesn’t look like the picture! I am sorry they took so long to bake for you. Maybe you need a hotter oven to get them to bake faster. This bars are looking so delicious, I will definitely try this recipe. Thank you for sharing. Yummy! Had them for our dessert this evening. Lots of compliments. Thank you! By the way, I decreased the sugar a bit, added an extra cup of rhubarb and added a pinch of nutmeg. Still delicious! Took me almost one year to finally try this recipe. My three grandsons seemingly “inhaled” the contents of 9″x13″ pan. Cooking time in my oven was minimum 45 mins. We really like it served with a dollop of Creme Fraiche(?spelling) and was served at our 150 Canada Day celebration BBQ. LOL, Happy Canada Day, so glad you (or they) enjoyed it!! Can you tell me if you use cold butter or softened to room temp? Also, if I don’t use parchment and use a glass pyrex, should I grease it first? Thank you, I love rhubarb and cannot wait to try this recipe. I use room temperature butter and if you don’t use the parchment then lightly grease so they will come out easily. I just have one more question….salted or unsalted butter? I have made these a couple of times now and they are so tasty. This time I added blackberries because we have a glut at the moment and they were just as great. Many thanks for sharing the recipe. How divine blackberries would be in these, thanks for sharing!! Tara–thank you SO MUCH for this recipe! I just made it this afternoon and my kitchen smelled heavenly! Husband thought the hot-from-the-oven sample was so good that he should put some in a ramekin accompanied by a big blast of whipped cream on it! Twice! I’ll have to make it again just to find out what it is really supposed to look like when cooled! I made it exactly as the recipe stated and it turned out perfectly!! I am so happy you love these. I have to make them again myself. I have a bunch of rhubarb in the freezer, can’t wait! i made this last night, it is so good, didn’t have alot of rhubarb so i used mixed fruit and it came out great, i made a 9 by 13 pan and my fruit was froze so i just added more flour. came out great. So glad you liked it. I will have to make a larger one too!! Do you have to cook it longer for double the recipe? Or is it the same length of time? I would start with the same length of time and then adjust to see when they are lightly browned. 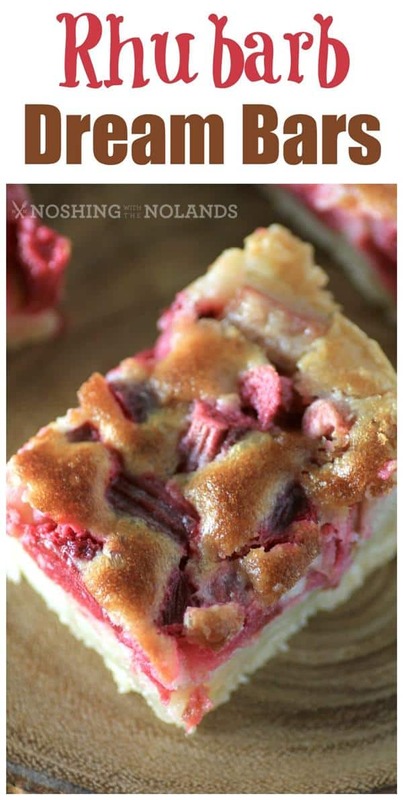 My mom called this Rhubarb Kuchen…love it! I just picked my rhubarb and have a lot. I want to make a pie, but saw this recipe and read the comments, so I will be baking this tonight. I have two grown men in my house so the 8×8 pan will not do, so if I double the recipe and use a 9×13 pan I’m assuming they will be a little thicker bars? They don’t like rhubarb but I know when they come out of the oven they will eat them and tomorrow morning they will be gone. Made the crust before in a different recipe, loved it, now with rhubarb, oh Lord. Well I better get baking. Thank you, I’m sure I will love this recipe. I hope this turned out for you and was devoured by all!! I followed your directions exactly except I added one extra cup of rhubarb. I used a glass baking dish. They are a hit, can’t wait to make them again ourselves!! Thanks for commenting! 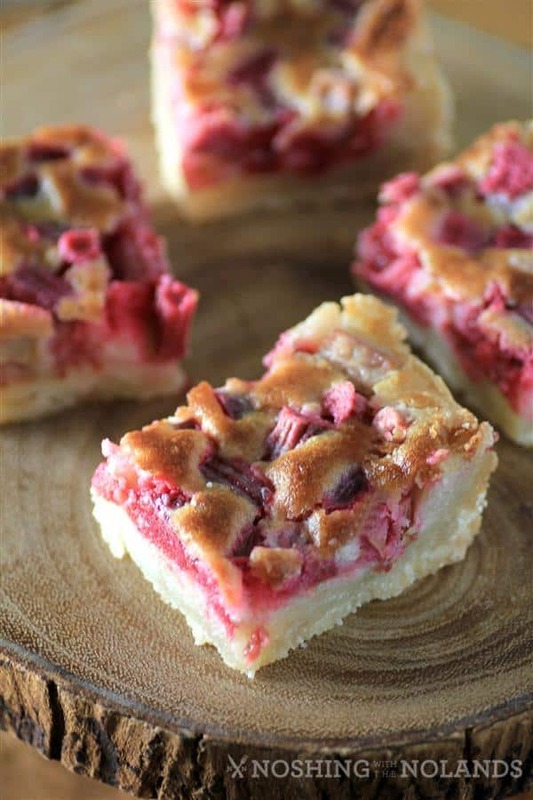 I made these with (frozen but) thawed, drained rhubarb, twice, and the middle pieces were gooey, both times, I baked longer than recommended, too, and the edges were getting very brown… BUT, they are delicious and everyone loved them. I took them to a potluck dinner, and had to promise to make them again. (Just didn’t put the middle ones out!) Maybe my eggs are too large or??? Should I increase the flour next time? I have not made them with frozen rhubarb but I would not thaw it and cook it frozen. You could add maybe a bit more flour and also foil the edges so the middle has a longer time to cook.